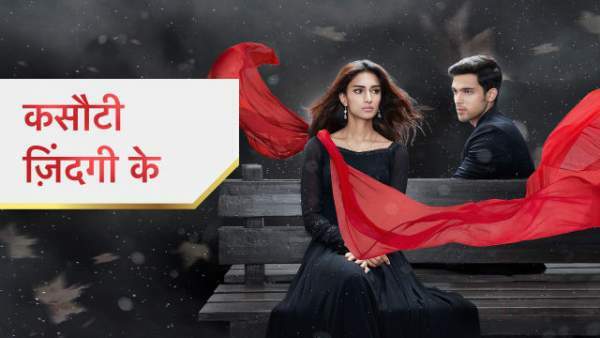 The written update of Kasautii Zindagii Kay 2 7th February 2019 episode television serial which airs on Star Plus. The episode begins with Anurag saying that after seven days, Prerna will become his life partner. He takes a thread from the idol Goddess and puts it one Prerna to protect their love from the evil threats. Prerna says that this thread will protect her love, but what about his love! She takes another thread and puts it on Anurag. Both of them are really happy with each other. Prerna says that she will wait for these seven days to end soon and Anurag fulfils his promise to be with her. Both of them hug each other and are lost in their love. The Goddess blessings shower on them when the Goddess’s chunni comes on to them. Naveen had reached the temple with his team. Naveen steps inside and removes the chunni. Naveen looks at Anurag and Prerna. Anurag stands in front of Prerna to protect her from Naveen. Naveen takes a gun in his hand and the priest tries to stop him. At the moment, Anurag takes Prerna and start running towards the jungle. Naveen and his team are following them. Anurag and Prerna reach on the road and start running from there. Naveen is with his team running behind them and asking Anurag to stop. Moloy has reached by everyone and the police have also come at the situation. The police team takes Naveen and his kidnappers with them. Naveen asks that he wants to talk with Anurag and speaks to him that it is just good luck for him today. Naveen says that he will come back and won’t spare him. The police take Naveen with him, but he is shouting that Prerna can’t be with someone else. Moloy says that everyone should go home now since everyone is waiting for them. Everyone leaves for home and Komolika’s team looks at all this. Komolika’s hired persons inform her about everything. Komolika is looking at Anurag’s photo and says that he is a lucky boy that he got a second chance to meet Komolika. Mohini is worried about everyone and asks Nivedita to call them. At the moment, Moloy comes with every one. Veena is happy to look at Prerna and hugs her tightly. Mohini is asking for Anurag and he comes back with Anupam. Mohini moves back after seeing Anurag. Vinita says thanks to Anurag for helping Prerna. Nivedita says that he shouldn’t risk his life to save anyone else. Anurag moves forward to speak with Mohini. He calls him and she moves back. Mohini says that he promised to stay at home and not risk his life again. She says that if something happens to him, she can’t live without him. She says that he doesn’t care about it since he has grown up and all this concern didn’t mean anything to him. Moloy gives a hint to Anurag to hug Mohini. Anurag hugs her and she says that she loves Anurag more than anything in her life. She denies to hug him as he is always showing an arbitrary behavior to her. She says that it is not a small thing, but Anurag hugs her tightly. Mohini also hugs him, but blames Prerna for everything. Anurag apologizes for her, but Mohini falls down. Everyone gets worried about Mohini and Moloy calls the doctor. Anurag says that he won’t do anything again. Prerna is rubbing Mohini’s hand, but Mohini wakes up and takes her hand away from Prerna. Mohini says that please stop troubling your mother, Anurag. Anurag says that he won’t do anything like this again. Mohini gets up and everyone asks her to take a rest. Moloy says a joke to make everyone happy. The doctor has come and asks everyone to go out for checking Mohini. Moloy stays there with Mohini and checks her pulse. Mohini asks him to go now. Moloy leaves and the doctor begin her check-up. Moloy asks to serve breakfast for everyone. Everyone comes down and Prerna is looking at Anurag. Anurag is also looking at her with a smile on his face. Nivedita says that she will bring the medicines which the doctor has written for Mohini. Nivedita looks at Prerna and Anurag looking at each other and stand in between them. Anupam is happy to look at Anurag and Prerna. Anupam takes Anurag with him at another side. Vinita says that Naveen is a bad dream to Prerna. Shivani asks whether they’ve filed the FIR against Naveen. Vinita asks about the vermilion on Prerna’s head and she says that while praying, it might have got on her forehead. Vinita says that it happens and it’s not good to remove the vermilion, but it is making her recall Naveen’s act. Vinita asks Prerna to remove the vermilion. She was left looking at Anurag but gets attacked from Komolika coming while looking at her phone. Komolika says that Prerna is trouble in her life and has two faces which attack stealthily. Komolika says that it’s her turn and look at her when she will attack Prerna. Prerna replies that she is waiting to see how far Komolika can go! Komolika smiles on her and says that look at it. Prerna leaves. Komolika comes and greets everyone there. She greets Anurag as well and says that she has come here for Anurag only. Komolika clarifies that Mishka was worried about him so she has come here. Komolika says that she is relieved after looking at Anurag in a healthy condition. Komolika adds that this is a good thing for her and Mishka too. Komolika is looking at Anurag and thinks that she would’ve met Anurag a long time before, but it is better late than never. Precap: Anurag hugs Prerna and thinks that how will he spend all these seven days without her! Moloy listens to everything and is really happy. Mohini looks at Komolika and thinks that Komolika is interested in Anurag!